Inspired by Michael St. George’s poetry and performances, Nancy Kamalanathan, an Advanced Credit Experience Co-op student at the AGYU organized an evening of dub poetry and spoken word performances. 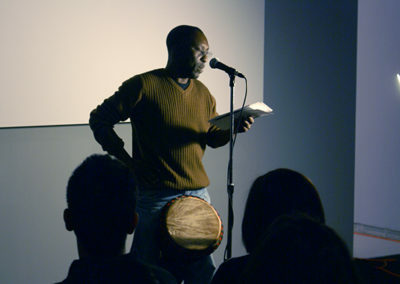 The event, held at the AGYU in June 2008, was hosted to give emerging artists the opportunity to share their work and to showcase the talent of veteran Toronto artists. Nancy, a poetess herself, was able to work at the AGYU thanks to the Westview Partnership initiatives by the Faculty of Education at York. Speak Your Mind attracted a variety of performers who tackled diverse issues from Tamil history to racism, from storytelling to revolution.